Bursa is a sac that is filled with liquid that can be found between tissues (bone, skin, tendons and muscle). Because of that fluid the bursa can be used as a cushion that has the function to decrease the friction and the irritation between the tissues that move between each other. When the bursae is not irritated, joints move smoothly and painless. But when it becomes inflamed and swollen, we speak of a bursitis and you will experience pain during physical activity. Subscapular Bursa or the Scapulothoracic Bursa: between the tendon of the Subscapularis muscle and the shoulder joint capsule. 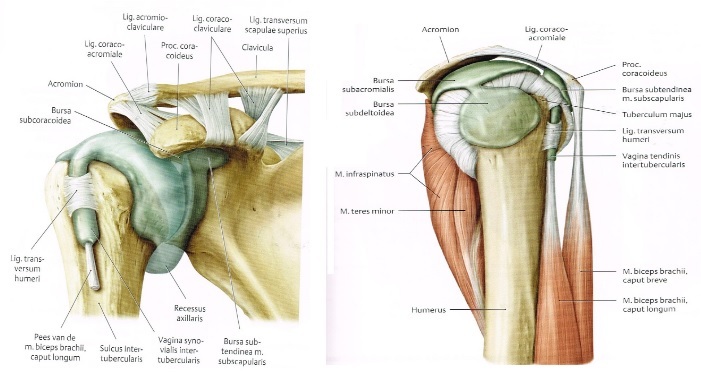 Subdeltoid Bursa: between the Deltoid muscle and the shoulder joint cavity. Subacromial Bursa: below the acromion process and above the greater tubercle of the humerus. It's function is to reduce friction in the space under the acromion. Subcoracoid Bursa: between the coracoid process of the scapula and the shoulder joint capsule. The subacromial and the subdeltoid bursa are often taken as a single bursa, the subacromial deltoid bursa. Infraspinatus Bursa: between the infraspinatus tendon and the capsule of the joint. Subcutaneous Acromial Bursa: is located above the acromion just beneath the skin. 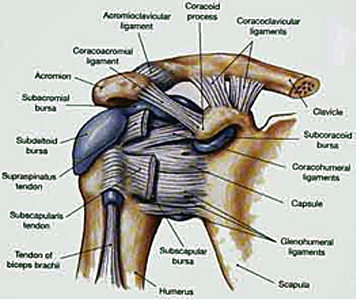 The superior limits of the bursae are the coraco-acromial ligament, acromion bone and the Deltoid. While the inferior limits are the humeral head, the shoulder joint and the Supraspinatus. The bursae do have a nerve supply, for instance the Subacromial Bursae has Suprascapular and Axillary nerve endings. Nociceptors such as free nerve endings would give information about painful stimulation and inflammatory responses to the brain. But also mechanoreceptors in the bursae of the shoulder are capable of giving propioceptive information of shoulder joint position. This shows that bursae don’t strictly function as a lubricator between tissues. Bursitis could be classified as Aseptic or Septic. If bursitis resulted from bacterial infection then it is considered septic. Trauma: Due to an accident, the bursa could become irritated and inflamed. Inflamed joint: When the whole joint is inflamed, the bursa can become inflamed as well as other structures. i.e. arthritis, gout. Bursitis could also be related to some professional activities (e.g. painter, …), although, this is not always the case in shoulder bursitis. Bursitis often develops secondary to injury, impingement, overuse of the muscle, or calcium deposits. Bursitis of the shoulder occurs commonly in people over 30 years old with a greater incidence in females. Younger and middle-aged patients are much more likely to experience acute bursitis than older patients with chronic rotator cuff syndrome. No significant difference of incidence was found between men and women specific for subacromial bursitis. Subacromial Bursitis typically presents with lateral or anterior shoulder pain. Patients only occasionally report a single macro traumatic event leading to persisting pain. Overhead lifting or reaching activities become uncomfortable, and the pain is often worse at night; interrupting sleep. the presence of pain in at least one activity (such as sleep, dress, work, grooming and sports) and at the end range of at least one ROM test (scapulothoracic tilting, scapulothoracic abduction, glenohumeral flexion, glenohumeral abduction, internal rotation, external rotation) with also a loss of 10 degrees or more in one or more of these tests. Patient who suffer from Subacromial Bursitis should have a glenohumeral abduction greater than 45 degrees to distinguish from patients with established "frozen shoulders". The Subacromial bursitis pattern of symptoms may occur in relation to rotator cuff tears, an impingement syndrome, frozen shoulder, or a systemic inflammatory disorder such as polymyalgia rheumatica (PMR) or rheumatoid arthritis (RA). Scapulothoracic Bursitis results from the mechanical pressure and friction between the superior-medial angle of the scapula and the adjacent ribs. Pain and a “popping” sensation are typical complaints. Aggravating activities include repetitive movements such as working overhead, reaching up and forward, or doing pushups. Local tenderness and palpable crepitus are characteristic. An effusion or hemorrhage into the area may be seen on MRI. Patients who suffer Subacromial, Deltoid or Subcoracoid Bursitis will experience painful shoulder movements, particularly during activities requiring abduction and extension. The pain starts gradually, originating deep inside the shoulder and develops over a few weeks or months. The pain may refer to the outside of the shoulder towards the elbow. Activities of daily living, household tasks and hygiene may be affected, due to limited and painful overhead movements. Patients suffering shoulder bursitis may also have interrupted sleep patterns. Rolling over the affected shoulder during sleeping can cause pressure on the inflamed bursa increasing the pain. The pain depends on the degree of inflammation in the shoulder, the range of motion of patients with shoulder bursitis is increased and the shoulder muscles are weaker. Other activities like contact sports are difficult to perform because they can cause more pain. Bursitis is frequently caused by another medical condition. For example, patients who suffer from subacromial bursitis, are likely to suffer from adhesive capsulitis, rotator cuff tendinopathy, supraspinatus tendinopathy or bicipital tendinopathy. Speed’s test is a special test to diagnose bursitis. In this test, the physician will ask the patient to extend the arm. The physician will then apply resistance while the patient performs an isometric flexion contraction. If the pain increases, the patient may be suffering from bursitis, although other rotator cuff injuries and tendinopathies can produce pain with this test. The physician can also let the patient perform Neer’s test to identify the occurrence of an impingement of the rotator cuff. But this test is also sensitive for subacromial bursitis. Therefore it is hard to distinguish whether a patient is suffering from bursitis, tendinitis or another injury that usually occurs when the bursa is inflamed. This makes it hard to determine the cause of bursitis when a patient seeks for medical help. The positive impingement test is another example of a diagnostic test, although it doesn’t exclude the other medical conditions that can be confused with bursitis. To differentiate a bursitis from a Supraspinatus Tendinopathy, which are often confused, a therapist can perform a test to isolate the Supraspinatus muscle. The patient abducts the arms to 90 degrees with the elbows extended and the arms internally rotated. The arms are placed 30 degrees anteriorly (in the coronal plane), and the patient resists as the examiner forces the arms downward. This is often referred to as the "Empty Can" test. Frozen shoulder is another medical condition which can be confused with bursitis. In this case, the symptoms can be differentiated with an easy test: if the patient cannot abduct the arm (glenohumeral abduction), this means the patient has a frozen shoulder. The downside of this test is that it can only exclude adhesive capsulitis but it does not necessarily confirm bursitis. Capsular syndrome is excluded if the movement is restricted in lateral rotation, abduction and medial rotation and pain is presented on C5 dermatome. Another important diagnosis to exclude is Acromioclaviculair syndrome, in which the patient presents with horizontal abduction restriction. In addition to pain in the area of the acromioclavicular joint and/or C4 dermatome. Patients with Bursitis and Tendinitis presentations have normal muscle power, while patients with Cuff tears can be distinguished by loss of power, pain in the C5 dermatome and Painful Arc during elevation. The Subacromial Deltoid bursa comes into conflict with the Acromioclavicular joint dysfunction. Positive painful arc ( pain between 60 and 120 degrees of abduction) indicates Subacromial Deltoid Bursitis. The Subcoracoid Bursa stands in relation with the anterior joint capsule. We speak of a Subcoracoid Bursa when the passive external rotation in 90 degrees of abduction is negative and the passive external rotation on 0 degrees is positive. A test for the Scapulothoracic Bursa focuses on the strength of the scapular muscles—including the Trapezius (upper, middle, and lower), Levator Scapula, Serratus Anterior, Latissimus Dorsi, Deltoids and Rotator Cuff muscles. A loss of muscle tone or an alteration of scapulothoracic rhythm may lead to increased friction between the medial border of the scapula and the rib cage, resulting in crepitus or snapping. Snapping scapula is a painful crepitus of the scapulothoracic articulation. This crepitus is a grinding or snapping noise with scapulothoracic motion that may or may not accompany pain. This condition is commonly seen in overhead-throwing athletes. Treatment of patients with this syndrome begins with nonoperative methods; when nonoperative treatment fails, several surgical options exist. Shoulder bursitis commonly co-exists with different shoulder pathologies (see differential diagnosis), which can make it hard to diagnose. Torn tendons or ligaments can cause as well the irritated bursa. Shoulder bursitis can be caused due a repeated minor trauma. This can be an overuse of the shoulder joint and muscles according to a more single significant trauma such as a fall for example. Bursitis can often be diagnosed by clinical examination; by visual inspection it is possible to notice some redness and warmth, local tenderness or stiffness in the joint with some swelling when the inflammation is worse. Physical examination of the subacromial bursitis reveals a reduced active range of motion with decreased elevation, internal rotation and abduction, primarily because of pain. The most painful arc of motion is between 70 and 120 degrees of abduction. Tenderness is found laterally below the acromion, anteriorly at the insertion of the Supraspinatus tendon on the greater tuberosity and, occasionally, along the supraspinatus muscle belly beneath the trapezius. Strength testing may reveal weakness with internal and external rotation, a finding that demonstrates an important factor in the etiology of these injuries: functional instability due to rotator cuff weakness. The impingement signs are usually positive. The Neer's sign is performed by forcibly forward flexing the internally rotated arm maximally above 90 degrees. The Hawkin's impingement sign refers to forced internal rotation of the arm performed during forward elevation to 90 degrees. Both tests are considered positive if they produce pain. The Compression test can also be used. This test is positive if the patient experiences subacromial pain. It may also indicate Supraspinatus Tendinitis. It’s also an axis pressure test for the humerus. The European Society of Shoulder and Elbow Surgery recommends using the Walch-Duplay score which was inspired by the Rowe rating scale and takes into account both subjective and objective data (stability, pain, sport level recovery, mobility) to assess clinical outcome. The Walch-Duplay score is the most currently used score in Europe for the assessment of the patient undergoing shoulder stabilization surgery. However, it is not a self-administrated questionnaire. The Walch-Duplay score (0 to 100 points) is composed of four items: activity, stability, pain and mobility. According to the Walch-Duplay score, results were classified as excellent (91 and 100 points), good (76 and 90 points), fair (51–75 points) or poor (under 50). The Visual Analogue Scale is used to describe the pain after the joint is palpated by the physiotherapist. The Disability in Arm, Shoulder and Hand-questionnaire ''DASH-questionnaire'' is a 30-item questionnaire that looks at the ability of a patient to perform certain upper extremity activities. This questionnaire is a self-report questionnaire where patients can rate difficulty and interference with daily life on a 5 point Likert scale. The Shoulder Pain and Disability Index (SPADI) was made to measure shoulder pain and disability. The SPADI contains thirteen items: five of them question pain, eight of them measure disability. The second version of this questionnaire was established to make the tool easier, and the tests take less than 5 minutes to complete. The Constant-Murley score (CMS) is a 100-points scale composed of a number of individual parameters. These parameters define the level of pain and the ability to carry out the normal daily activities of the patient. The Constant-Murley score was introduced to determine the functionality after the treatment of a shoulder injury. The test is divided into four subscales: pain (15 points), activities of daily living (20 points), strength (25 points) and range of motion: forward elevation, external rotation, abduction and internal rotation of the shoulder (40 points). The higher the score, the higher the quality of the function. Another scale which we can be used is the Shoulder Disability Questionnaire (SDQ). It contains 16 questions about daily life activities accompanied by shoulder pain. The scale includes questions on physical, social and emotional restrictions. Using this questionnaire, a functional status of symptoms (pain and / or restricted movement) in the shoulder region can be made. The Simple Shoulder Test questionnaire (SST) is a 12-questions scale about the functioning of the shoulder which the patient must answer with yes or no. This test allows the clinician and the patient to compare shoulder function before and after treatment. A common treatment for bursitis is the use of injections with or without the use of ultrasound guidance or palpation. These injections could contain steroids or other analgesic substances. One study examined the use and effectiveness of botulinum toxin type B in the treatment of Subacromial Bursitis and shoulder impingement syndrome. The conclusion was that botulinum type B can be a useful strategy and that it has a great potential for replacing steroids as a treatment for Subacromial Bursitis or shoulder impingement syndrome. Inflammation can also be treated with anti-inflammatory medications such as Motrin, Advil, Aleve, Celebrex, or one of many others. These all fall within the category of 'non-steroidal anti-inflammatory medications.' Taken by mouth. These medications help with the inflammation of the tendons and bursa, and also help reduce the discomfort. Since the appearance of bursitis is due to another medical condition, treating the cause of this bursitis should be the first step. But since the bursa is still painful, injection is often used to cure this pain. This injection can be in the bursa, or in the muscle itself. A recent study has shown that both methods reduce the pain, but there is no significant difference between the two methods. Injection could be either ultrasound-guided or palpation-guided. However, studies show that the ultrasound-guided injection is more precise to find the exact location of the bursa. Once the inflammation has been reduced, ultrasound therapy can be used to continue the healing process. The best initial approach for a Scapulothoracic bursitis is a nonoperative treatment plan that combines scapular strengthening, postural reeducation, and core strength endurance. One study focusing examined the difference between one group treated with ultrasound-guided injection (UGI) and another group with ultrasound-guided injection and home exercise program (UGI-exercise) for 1 month the treatment of Subacromial Bursitis. Exercises included exercises for shoulder lowering with decoaptation that the patient must remember to reproduce during all the common daily activities. In addition to assisted active self-mobilization for the recovery of range of motion in all directions and isometric strengthening with elastic bands for Rotator Cuff muscles and Deltoid. Lastly, stretching in elevation, abduction and rotation performed statically by placing the patient-specific postures that allow the lengthening of the shortened muscles and the recovery of the last degrees of movement. 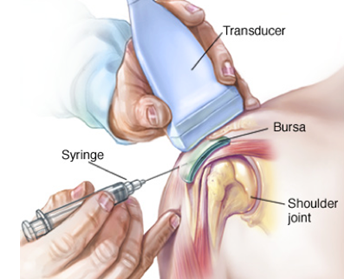 The study concluded that ultrasound-guided injection combined with shoulder exercises in the treatment of Subacromial Bursitis is effective in relieving pain in the short and medium term. Once the pain starts to diminish, the physiotherapist will set up an individualized shoulder strengthening and stretching exercise program. Patients with shoulder bursitis can learn ways to move the shoulder in ways that will not reproduce inflammation. Table Slides (Flexion): Start with your hand on a table (facing the table) on a towel as shown below, Stretch your arm forward on the table by sliding the towel. Feel a stretch under your arm. Do 20-30 repetitions. This exercise is modified for abduction as well. Scapular wall slides: Stand in an upright position with your back against the wall. Raise your arms in 90 degrees abduction and flex your elbows to the 90 degree position as well. Your arms have to be pressed against the wall at all times. Make sure your handpalms are facing forward. Now you will abduct your arms as high as you can while extending the elbows at the same time. Do this slowly and go back to the starting position. Do 10 – 12 repititions. Open Book Stretch: Placed a rolled up towel on a mat table between the shoulder blades and lie flat on your back. Keep your arms folded together over the top of your body, with your hands together. Open your arms up, like you are simulating the opening of a book, feeling a stretch in the front of your shoulder. Hold for 30-60 seconds and do 1-3 repetitions two times a day. Rowing (using a theraband): This is a good exercise to train the scapular stabilizing muscles. chest level. Pull the theraband backwards most importantly pulling the shoulder blades together. Do two sets of 10-20 repetitions three times a week. Shoulder bursitis is a common cause of shoulder pain. This bursitis is in most cases caused by an overload, trauma, an inflamed joint or elder age as it lays between different structures such as muscles, bones or other structures. Since it is mostly caused by another pathology nearby, it is very difficult to differentiate these many shoulder pathologies. Pain, decreased range of motion, loss of strength and loss of functionality are the main complaints of the patients. There is evidence using ultrasound guided-injection in combination with physical therapy reduces pain and are beneficial for the recovery. ↑ 2.0 2.1 Hitzrot, James Morley. "Surgical diseases of the shoulder bursae." Annals of surgery 98.2 (1933): 273. ↑ 4.0 4.1 Hsieh, Lin-Fen, et al. "Is ultrasound-guided injection more effective in chronic subacromial bursitis?." Medicine and science in sports and exercise 45.12 (2013): 2205-2213. ↑ H. B. Skinner, Current Diagnosis & treatment in orthopaedics, the McGraw-Hills companies, 2008. ↑ 7.0 7.1 7.2 7.3 Walker‐Bone, Karen, et al. "Prevalence and impact of musculoskeletal disorders of the upper limb in the general population." Arthritis Care & Research 51.4 (2004): 642-651. ↑ J. Willis Hurst, Douglas C. Morris, Chest pain, Futura publishing company, 2001. ↑ Gardner E. The innervation of the shoulder joint. The Anatomical Record,1948:102 page 1-18. ↑ 19.0 19.1 O. Dreeben-Irimia, introduction to physical therapy for physical therapist assistants, 2011, p 84-85. ↑ Hardwick DH, Beebe JA, McDonnell MK, Lang CE. A comparison of serratus anterior muscle activation during a wall slide exercise and other traditional exercises. Journal of Orthopedic Sports Physical Therapy, 2006 December: 36(12) page 903 – 910. ↑ Ide K, Shirai Y, Ito H, Ito H. Sensory nerve supply in the human subacromial bursa. Journal of Shoulder and Elbow Surgery, 1996 September – October: 5 page 371 – 382. ↑ 26.0 26.1 Chen, Max JL, et al. "Ultrasound-guided shoulder injections in the treatment of subacromial bursitis." American journal of physical medicine & rehabilitation 85.1 (2006): 31-35. ↑ 27.0 27.1 O. Dreeben, physical therapy clinical handbook, Jones and Barlett, 2008, p209-211. ↑ Gasparre, Giuseppe, et al. "Effectiveness of ultrasound-guided injections combined with shoulder exercises in the treatment of subacromial adhesive bursitis." Musculoskeletal surgery 96.1 (2012): 57-61.